I remember when I first began juicing many years ago dropping a piece of watermelon down the chute of the running juicer and all the seeds promptly being spat back at me. Aside from hitting me in the face – one of the few occasions that I have been glad to need to wear glasses – the seeds went everywhere ricocheting off the ceiling, walls and kitchen cupboards. I was still finding them several weeks later. The moral is when you juice a watermelon, turn the juicer off, put the fruit in the chute, put the pusher back in and then switch the machine on. I was sent a Sage by Heston Blumenthal nutrijuicer to play with; which I will write more about in due course – first thoughts are that it is very efficient, but also rather large. This cucumber and melon combination is very refreshing, and I suspect would make an excellent basis for a cocktail or ice lolly too. For a pretty pink juice you need to peel the cucumber, otherwise it is just as good, but really not very pretty. The squeeze of lime brightens the flavour up considerably. Use chilled fruit from the fridge for this and serve immediately. There is very little heat transfer from the juicer so your juice will be fridge cool. 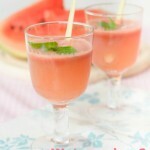 If you try this Recipe: Cucumber & Watermelon Refresher please tag #FussFreeFlavours on Instagram or Twitter. It is amazing for me when for me when you make one of my recipes and I really do love to see them. You can also share it on my Facebook page. Please pin this recipe to Pinterest too! Thanks for reading Fuss Free Flavours! Run the watermelon, cucumber and lime through the juicer. 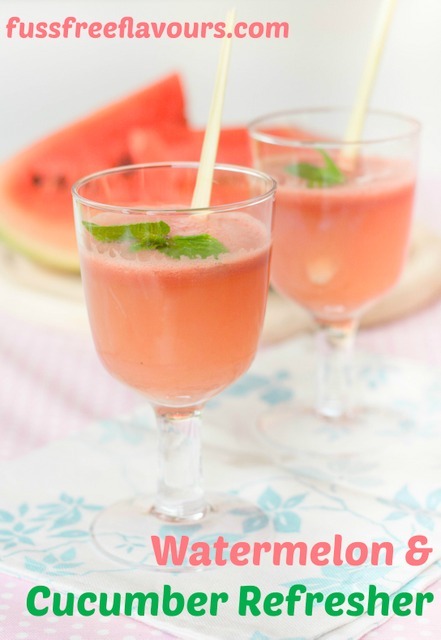 If the watermelon contains lots of seeds then stop the juicer when loading the fruit into the chute. Give the juice a stir, serve in a pretty glass with a sprig of mint and a piece of lemon grass.